As global forces converge to create unprecedented change across all industries, the future of travel and tourism will be shaped by those companies and destinations which provide unique and meaningful experiences, harness the power of networks, provide a personal service to sustainability-minded consumers, and are led by trustworthy and responsible leadership. 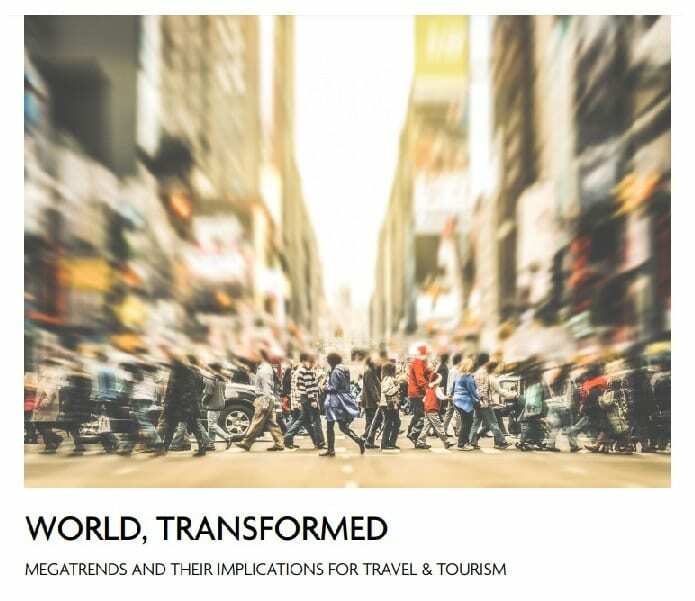 These are the findings of a new report, “World, Transformed: Megatrends and their implications for Travel & Tourism,” produced by the World Travel & Tourism Council (WTTC), which represents the global private sector of travel and tourism, and Bloomberg Media Group. Leveraging Bloomberg Media Group’s proprietary intelligence and market-leading analysis and WTTC’s industry perspective, the report examines how powerful global demographic, political, economic and technological forces are impacting the travel and tourism landscape, producing different expectations among consumers, obligations for businesses and policymakers, and opportunities to succeed. Travel & Tourism is one of the fastest growing sectors, accounting for more than 10% of global GDP. According to the report, sustaining its growth and hitting industry forecasts, such as the 8 billion air travelers predicted by 2037, will require continuous innovation and reinvention across the sector. Leaders will need to manage companies that are able to pivot quickly in response to new customer demands and expectations, the next revolution in data capabilities, and heightened business risks. Consumers are increasingly moving beyond experiences as social currency to seeking shared experiences to deliver meaning, self-improvement and stronger connections. Millennials and Generation Z have little loyalty to employers or brands and are more likely to rely on personal networks than experts. Consumers value technology but are uncomfortable with over-automation, which seeks to replace customer interaction with intelligent bots. Consumers want to be treated as individuals by companies that trust their privacy, share their values, and provide authenticity. Travel and tourism companies will succeed by responding to the rise of ethical consumption trends and protecting the very destinations they promote. Reality, Enhanced: As people, communities and businesses become more sophisticated in adapting new technologies for analogue experiences, new ideas and beliefs are emerging about how best to live a connected life. Online and offline experiences as a result are becoming increasingly integrated. More than $8.2 trillion global expenditure is forecasted for the experience economy, in addition to an increased emphasis on physical and mental wellbeing. With experiences at the core of travel and tourism, the sector has the potential to design meaningful, unique, frictionless and even unplugged journeys that directly respond to these changing values. Life, Restructured: The growth of tech-powered economies such as the “gig economy” and “sharing economy” continues to create new expectations for work, life and culture. Twenty-five percent of workers in the US and EU engage in independent work today, and the independent workforce is only going to rise. As the structure of people’s lives become more fluid and self-directed, travel will become more of a lifestyle, mobility will increasingly become communal and service-based, and businesses will need to rethink their workforce. Data, Revolutionised: The power of data will drive a new frontier of innovation and deliver unprecedented ability to better understand and predict outcomes. While over 180 ZB of data is expected to be generated by 2025, consumers remain uneasy when it comes to their security and privacy. These technologies offer tremendous opportunities for the travel and tourism sector, including leveraging data to build a fluid, cohesive travel experience, implementing large-scale Internet of Things, facial recognition and use of voice assistants to streamline travel. Businesses will need to lean into brand values to guide their innovation and prioritise transparency with their consumers. Power, Redistributed: Significant shifts in power dynamics will have dramatic effects on both local culture and global markets as technology, globalisation and population growth continue to redistribute power. These forces create new centres of social and economic influence in the East and South. For travel and tourism organizations, merely establishing presence in new markets won’t be enough as it will be critical to understand the future consumer. Businesses will need to invest in creating sharable moments, strive for customer service excellence and ensure their brand has a point of view in the global, social discussion. Consumption, Reimagined: As the availability of resources and health of our planet are increasingly threatened, there is a need for responsibly balancing short and long-term priorities. By 2050, the global population will exceed 9.7 billion and consumption of natural resources will triple. Sustainable business practices and aligning brand stories to sustainable solutions can become the core of a robust growth strategy for the travel and tourism sector. Safeguarding destinations, environmental leadership and community health will therefore be integral to the customer experience. Flyers RIght warned the Trump Administration that more 9/11 type terrorist attacks may occur unless it changes a series of ineffective or dangerous aviation security policies it is pursuing.